Day three of our trip to the smoke-filled Canadian Rockies our motor coach took us to St. Mary Lodge and Resort on the US side of the border. 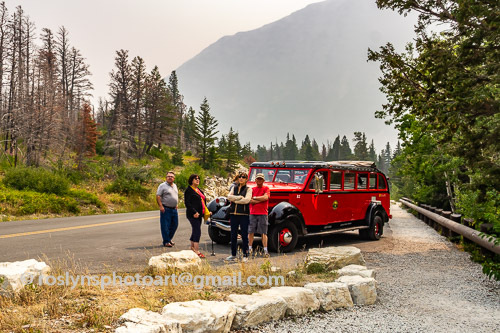 We boarded Red Jammers, restored vintage touring coaches from the 1930s. We traveled on Going-to-the-Sun Road which is closed during the winter because of snow. But this year it was closed half way along because of fires. So our journey ended at Logan Pass Visitor Center in Montana. At Logan Pass Visitor Center we had time to roam around. I always enjoy an opportunity to get out and stretch my legs. We were close enough to the mountains that it was possible to see some details. Then back on the Red Jammers. Originally built for sightseeing in the US National Park System, these 25-foot long touring coaches with individual doors for each row, were restored in 2000 by the Ford Motor Company and are the only remaining buses of their kind in operation today. Just touring in the coaches was fun in itself. We returned to our hotel in Waterton, Alberta, a very sweet little tourist town that I could see visiting again. We decided to eat at the same restaurant with a river view where we had enjoyed dinner the night before, Bayshore Lakeside Chophouse, attached to the hotel. Categories: Food, National Parks, Nature, Outdoors, Parks, Photography, Restaurants, Scenery, Tourist Attractions, Tours, Travel | Tags: Alberta, Bayshore Lakeside Chophouse, Canada, Going-to-the-Sun, Logan Pass, Montana, Red Jammers, road, USA, Visitor Center, Waterton | Permalink.